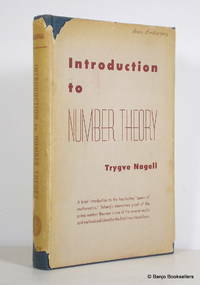 We can help you find the number theory books you are looking for. As the world's largest independent marketplace for new, used and rare books, you always get the best in service and value when you buy from Biblio.com, and all of your purchases are backed by our return guarantee. Dover Publications, Incorporated, 1963. Paperback. Acceptable. Disclaimer:A readable copy. All pages are intact, and the cover is intact. Pages can include considerable notes-in pen or highlighter-but the notes cannot obscure the text. At ThriftBooks, our motto is: Read More, Spend Less.Dust jacket quality is not guaranteed. Kessinger Publishing, LLC, 2007. Hardcover. Very Good. Disclaimer:A copy that has been read, but remains in excellent condition. Pages are intact and are not marred by notes or highlighting, but may contain a neat previous owner name. The spine remains undamaged. At ThriftBooks, our motto is: Read More, Spend Less.Dust jacket quality is not guaranteed. New York and Stockholm: John Wiley / Almqvist & Wiksell, 1951. First printing (no additional printings listed). 309 pp. including index. Previous owner's bookplate is on the front pastedown. Endpapers mildly foxed. Otherwise a fine, unmarked copy in a tight binding. The dust jacket is price-clipped and is chipped at the spine ends (the publisher's name is mostly gone) and one corner. The spine is darkened. Previous owner's name is written on the front panel. In Brodart archival dust jacket protector.. First Edition. Hard Cover. Near Fine/Fair. 8vo - over 7¾" - 9¾" tall.